Are all your holiday gifts neatly put away and thank you notes written? Or are you like me, tripping over stray Nerf bullets and Barbie shoes, trying to find a home for all those little stocking stuffers, and no thank yous sent to-date? No need to stress. After braving the post-holiday mall rush of returns and gift card exchange last week, I noticed that almost every large retailer was selling discounted plastic totes in every size imaginable. Pick up a tote or two for each of your children to fill with their holiday goodies during this honeymoon period of wanting to play with everything new. In a month or so, revisit the tote idea and ask your kids to organize and find a permanent home for their new gifts – maybe even selecting a few older toys for donation at the same time. 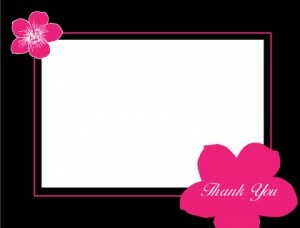 Keep the thank you card process simple and low key too. See our recent advice on writing short and sweet thanks, and allow younger writers to simply contribute a portion of the note or add artwork. Do you have an awesome photo of your kids taken over the holidays? Add that photo to ‘Funky Photo Thanks’ shown below. This card is available in flat or as a folded card option depending on how ambitious your thank you note authors are! 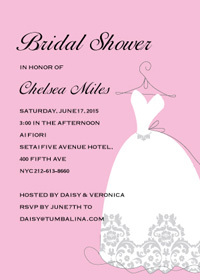 Another fun design is ‘Contemporary Floral’ shown below. Available in several vibrant color options, this card is a timeless choice for hip tweens and trendy moms alike. Again, this card is available in a flat or folded option. 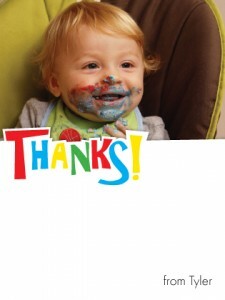 Find a thank you card design that you love and order a number to get you through the year. Pricing for these high quality custom cards is less than you’d think and all order quantities over 50 ship for free.